bMedical Genetics Services (E.R., L.B.J., J.A.M.S. ), Hospital de Clínicas de Porto Alegre, Porto Alegre, BrazileDepartment of Internal Medicine (L.M.V., L.B.J. )fPostgraduate Program in Medicine: Medical Sciences (L.B.J. ), Universidade Federal do Rio Grande do Sul, Porto Alegre, Brazil. BACKGROUND AND PURPOSE: Polyglutamine expansion spinocerebellar ataxias are autosomal dominant slowly progressive neurodegenerative diseases with no current treatment. MR imaging is the best-studied surrogate biomarker candidate for polyglutamine expansion spinocerebellar ataxias, though with conflicting results. We aimed to review quantitative central nervous system MR imaging technique findings in patients with polyglutamine expansion spinocerebellar ataxias and correlations with well-established clinical and molecular disease markers. MATERIALS AND METHODS: We searched MEDLINE, LILACS, and Cochrane data bases of clinical trials between January 1995 and January 2016, for quantitative MR imaging volumetric approaches, MR spectroscopy, diffusion tensor imaging, or other quantitative techniques, comparing patients with polyglutamine expansion spinocerebellar ataxias (SCAs) with controls. Pertinent details for each study regarding participants, imaging methods, and results were extracted. RESULTS: After reviewing the 706 results, 18 studies were suitable for inclusion: 2 studies in SCA1, 1 in SCA2, 15 in SCA3, 1 in SCA7, 1 in SCA1 and SCA6 presymptomatic carriers, and none in SCA17 and dentatorubropallidoluysian atrophy. Cerebellar hemispheres and vermis, whole brain stem, midbrain, pons, medulla oblongata, cervical spine, striatum, and thalamus presented significant atrophy in SCA3. The caudate, putamen and whole brain stem presented similar sensitivity to change compared with ataxia scales after 2 years of follow-up in a single prospective study in SCA3. MR spectroscopy and DTI showed abnormalities only in cross-sectional studies in SCA3. Results from single studies in other polyglutamine expansion spinocerebellar ataxias should be replicated in different cohorts. CONCLUSIONS: Additional cross-sectional and prospective volumetric analysis, MR spectroscopy, and DTI studies are necessary in polyglutamine expansion spinocerebellar ataxias. The properties of preclinical disease biomarkers (presymptomatic) of MR imaging should be targeted in future studies. Many studies evaluated brain MR imaging in SCA, some with conflicting results. Most evaluated a small number of patients with a high risk of bias. Although different methodologies were applied with multiple qualitative and quantitative approaches, it is still unknown which technique and which region is best-suited for a reliable biomarker for future randomized clinical trials in a given PolyQ-SCA. So far, no systematic review has been published on the subject, to our knowledge. We aimed to perform a systematic review of the studies that evaluated central nervous system quantitative MR imaging techniques in patients with PolyQ-SCA, to assess the correlations of reported findings with well-established clinical and molecular disease markers and to evaluate the reported sensitivity to change of the findings, when available. The objective and search strategy were established by using the Population, Intervention, Comparator, Outcome format. We searched MEDLINE, LILACS, and Cochrane data bases of clinical trials between January 1995 and January 10, 2016. We restricted the results to humans; no language restrictions were adopted. Population, Intervention, Comparator, Outcome–specific search terms regarding the population (“spinocerebellar ataxia,” “autosomal dominant cerebellar ataxia”) were combined with intervention-of-interest keywords (“MR imaging,” “NMR,” “spectroscopy,” “volumetry,” “morphometry,” “gray matter atrophy,” “regional atrophy,” “white matter atrophy,” “DTI,” “tractography,” “diffusion tensor”). After performing the search, we also performed manual citation review to ensure that all relevant studies were found. The review process followed the Preferred Reporting Items for Systematic Reviews and Meta-Analyses guidelines.15 For the complete search strategy, see the On-line Appendix. To be included, a given study should meet at least 1 criterion from each of the following: 1) study design: systematic review, randomized clinical trial, cohort, case-control or case series; 2) population: symptomatic individuals with a molecular diagnosis of a PolyQ-SCA (SCA1, SCA2, SCA3/MJD, SCA6, SCA7, SCA17, and DRPLA) or asymptomatic carriers of PolyQ-SCA mutation; and 3) intervention: CNS MR imaging with ≥1.5T field; image processing by using volumetric analysis, MR spectroscopy, diffusion tensor imaging, tractography, or other MR imaging quantitative techniques. In addition, at least 1 of the following data points regarding the subjects, age, age at disease onset, CAG repeat length on the expanded allele (CAGexp), or scores obtained from a validated ataxia scale should be reported. We excluded studies with the following characteristics: 1) study design: case reports or reviews, other than systematic; 2) population: absence of a healthy control group or <20 individuals per group or representing <5 different families (when informed); and 3) intervention: qualitative CNS MR imaging analysis or neuroimaging studies other than MR imaging. Prospective studies with ≥15 individuals and studies on presymptomatic individuals with ≥10 subjects were accepted, though the conclusions of studies with <20 individuals per group were considered of limited value. Two independent reviewers performed the search (A.K., E.R.). Before performing data extraction, we established a consensus of eligible articles between reviewers and a separate assessor (J.A.M.S.). For data extraction, we considered author, year, country, study design and medical scenario, population, sample size, outcomes, MR imaging acquisition and postprocessing, MR imaging main findings, clinical molecular correlations, and study limitations. Comparisons of MR imaging findings among different SCAs, qualitative findings, and diagnostic properties of MR imaging for SCAs were not analyzed. Seven hundred six articles were retrieved on the basis of the title/abstract data base search; 698 on MEDLINE, 4 on LILACS, and 4 at the Cochrane Library. Eighteen studies (case-control and prospective cohorts) were included for critical evidence evaluation based on our eligibility criteria. See Fig 1 for the study-selection procedures and the On-line Appendix for the complete search strategy. Flow diagram outlining the selection procedure. The asterisk indicates that the total number of studies is lower than the sum of individual studies because some studies were excluded for ≥2 reasons and some studies evaluated >1 SCA subtype. Double asterisks indicate sample size exclusion criteria: <20 individuals per group for cross-sectional studies, <15 individuals for prospective studies, and <10 individuals per group for studies in presymptomatic individuals. For main descriptive data of included studies, see On-line Tables 1–4. Eighteen studies were selected for this review: 2 including SCA1, 1 including SCA2, 15 including SCA3/MJD, 1 including patients with SCA7, and 1 study including presymptomatic carriers of SCA1 and SCA6 mutations. No eligible studies were found for SCA17 and DRPLA. On-line Table 1 summarizes the results of volumetric analysis, spectroscopy, DTI, and other methods for infratentorial regions, and On-line Table 2 gives the results for supratentorial regions. Although we found significant bias in most studies (selection and measurement bias being the most frequent), in general these findings did not limit the overall results, considering the relative consistency of findings across studies (On-line Tables 3–6). Volumetric studies used voxel-based morphometry (VBM) and surface-based analysis. VBM analysis, implemented in different versions of the SPM software (SPM2, SPM5, and SPM8; tools; http://www.fil.ion.ucl.ac.uk/spm/software/spm8), varied among selected studies, which used ROIs or VOI analysis and/or whole-brain volume analysis with standardization maps. Seven studies used ROI or VOI16,18⇓⇓⇓⇓–23 analysis (2 with manual outlining), and 8 studies performed whole brain analysis (5 automated24⇓⇓⇓–28 and 3 semiautomated17,29,30 processing). One study performed both manual and automated morphometric measurement of the thalamus.31 Surface-based analysis with the FSL Toolbox (http://fsl.fmrib.ox.ac.uk/fsl/fslwiki/Randomise) and FreeSurfer (http://surfer.nmr.mgh.harvard.edu) were used in 2 articles. All spectroscopic studies were performed by using single-voxel protocols. A single study evaluated MR imaging volumetric analysis in presymptomatic individuals, the Ataxia Study Group study of individuals at Risk for SCA1, SCA2, SCA3, SCA6, SCA7 (RISCA).30 This was a multicenter observational European study, in which 50 presymptomatic individual carriers of a PolyQ-SCA mutation and 33 noncarrier controls underwent MR imaging in 8 centers. Carriers and noncarriers were grouped for evaluation in 26 carriers and 13 noncarriers for SCA1 mutations, 4 carriers and 8 noncarriers for SCA2 mutations, 9 carriers and 6 noncarriers for SCA3/MJD mutations, and 11 carriers and 6 noncarriers for SCA6 mutations. According to our criteria, only SCA1 and SCA6 data (pooled controls) were reviewed. The authors reported symmetric gray matter volume loss in the cerebellar vermis and hemispheres, with sparing of vermian lobules I, II, and X and of hemispheric lobules I, II, and crus II, on VBM analysis. 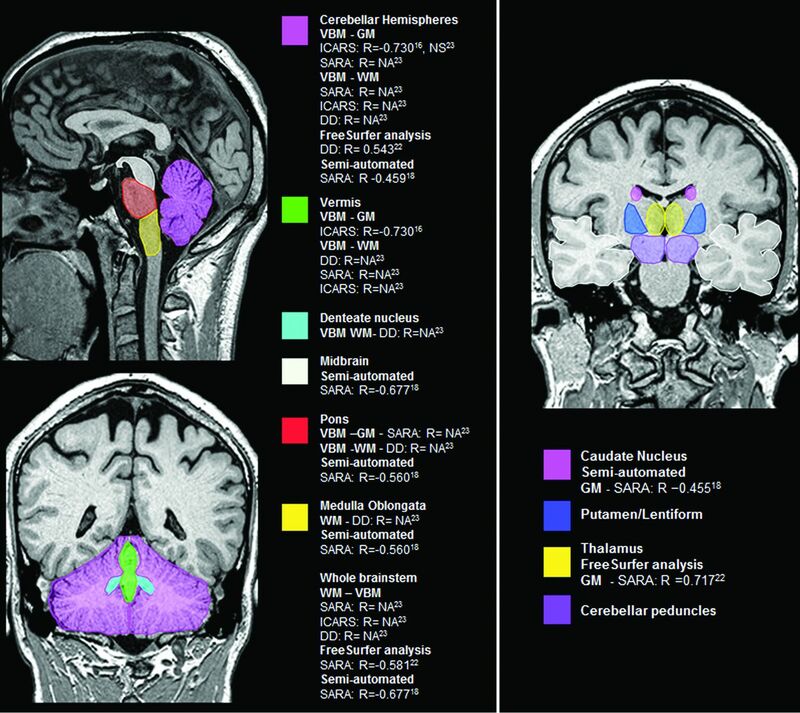 White matter volume loss was depicted in the peridentate regions, middle cerebellar peduncles, dorsal portion of the pons, and the superficial portion of the cerebral peduncles.18 International Cooperative Ataxia Rating Scale (ICARS) correlated inversely with average cerebellar gray matter volume (R = −0.53) and average white matter volume of the peridentate regions, middle cerebellar peduncles, dorsal pons, and cerebral peduncles (R = −0.54), and it correlated directly with CSF volume in the posterior cranial fossa (R = 0.45). The P values for correlation analysis were not given. No gray or white matter volume losses were observed in the cerebral hemispheres of patients with SCA2. Semiautomated volume analysis from a single study29 showed results similar to those of the overall VBM analysis with atrophy in the total cerebellum, cerebellar hemispheres and vermis, whole brain stem, midbrain, pons, and medulla oblongata. Main encephalic regions with volume loss and its clinical and molecular correlations in SCA3/MJD. DD indicates disease duration; NA, not available; NS, not significant. In the study by Reetz et al,17 the main effect in gray matter changes on VBM after 2 years of follow-up in the SCA3/MJD group (n = 19) was restricted to the bilateral putamen and pallidum. Thirty patients with SCA3/MJD were also prospectively assessed in a Brazilian study.16 No losses of gray matter and white matter densities on VBM analysis were seen after 12.5 months.16 On semiautomated volumetric analysis, Reetz et al17 found significant atrophy progression in the whole brain stem, pons, putamen, and left caudate in SCA3/MJD, with no correlations with CAGexp. All 6 included MR spectroscopy studies evaluated only patients with SCA3/MJD, comprising 235 individuals.19⇓⇓–22,25,26 Many of the studies evaluated different ROIs, which made it difficult to pool data. D'Abreu et al16 assessed MR spectroscopy in 19 patients with SCA3/MJD after 12.5 months. No difference in the NAA/Cr ratio in the superior posterior region of the left hemisphere was found. Other Quantitative MR Imaging Evaluations. MR Imaging Volumetric Studies: Presymptomatic Individuals. RISCA was the only study included that evaluated individuals with SCA6.30 Eleven presymptomatic SCA6 carriers (6 women), with a mean estimated time from onset of −20 years (−23 to −16) (mean age, 46 years), were studied. VBM and semiautomated analysis results showed no differences between SCA6 mutation carriers and noncarriers. 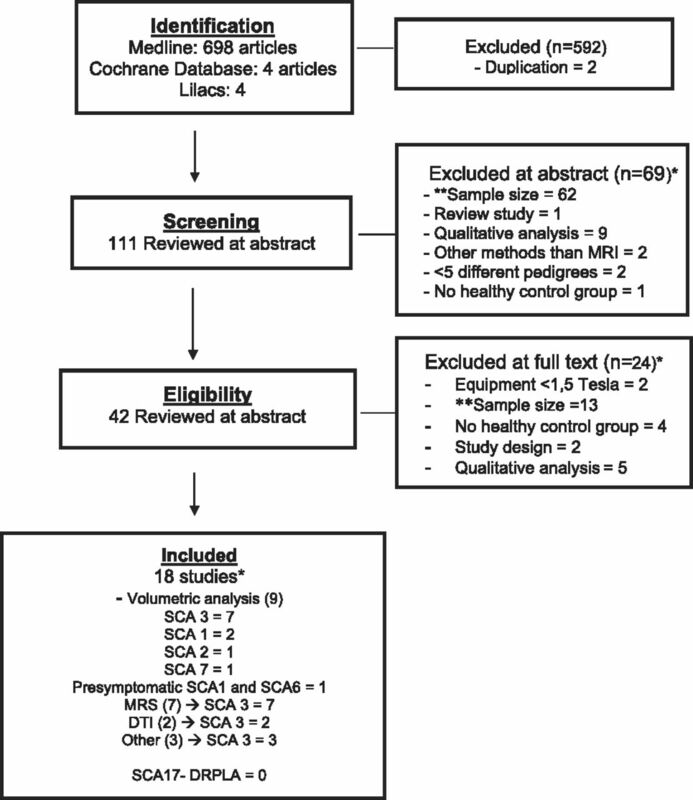 This is the first systematic review on quantitative MR imaging findings of PolyQ-SCA. Although the number of MR imaging studies published for these disorders in the past 10 years is quite large, the small sample sizes and qualitative analysis of the findings limited the validity of most study results. We adopted a critical evaluation approach,35 which aimed to include studies that met a predetermined threshold of quality, to define our eligibility criteria. Our most restrictive criterion was related to study sample size. A threshold of sample size was selected (exclusion criteria: <20 individuals per group for cross-sectional studies, <15 individuals for prospective studies, and <10 individuals per group for studies in presymptomatic individuals) because no sample size estimation with study power definition was provided in the studies found. Recent studies in neuroimaging applied different techniques such as manual segmentation, voxel-based morphometry, spectroscopy, and DTI. In fact, most studies described in this review performed volumetric estimations and objective evaluations as in DTI or in spectroscopy. We will now discuss the current knowledge on MR imaging quantitative techniques for PolyQ-SCAs and potential areas for future research, considering these instruments as potential surrogate outcomes for future clinical trials. SCA3/MJD was by far the most studied PolyQ-SCA with MR imaging. SCA3/MJD studies generally presented larger sample sizes and lower risks of selection bias. Regarding volumetric studies, cerebellar hemispheres and vermis, whole brain stem, midbrain, pons, medulla oblongata, cervical spine, caudate and putamen nuclei, and thalamus seem to be the best target regions as surrogate outcomes in SCA3/MJD according to cross-sectional studies.16,29,24,32,33 In the study by Schulz et al,29 the stepwise inclusion of the pons and medulla oblongata together explained 53% of the variance in SARA in a linear regression model, and in another study, the cross-sectional area of the cervical spine explained 49.1% of SARA scores in a regression model built with disease duration and cerebellar volume.9 Some minor differences in the results across studies might be related to technical differences between semiautomated and automated analyses and differences between VBM and surface analysis (FreeSurfer).35⇓–37 Although several volumetric analyses have been published, the use of at least 3 technical approaches, the heterogeneity of comparisons with independent variables (CAGexp, disease duration, ataxia scales, and so forth), and the way data are presented in VBM studies prevented any data meta-analysis. On a prospective study, the main gray matter changes in the SCA3/MJD group were in the whole brain stem, pons, putamen, and caudate.17 The 2-year SRMs of region-specific volume loss on MR imaging were −1.1 for the whole brain stem, −0.9 for the pons, −1.5 for the putamen, and −1.6 for the caudate in SCA3/MJD, which is similar or even higher than the 1.4 SRM of SARA.17 Another study did not find gray matter and white matter density losses on VBM analysis in 30 patients with SCA3/MJD after 12.5 months.16 This finding could be explained by both shorter follow-up and statistical differences regarding processing of VBM (an unbiased analysis, corrected for many different comparisons) and semiautomated volumetric analysis (fewer target regions), with semiautomated volumetric analysis apparently presenting greater study power for longitudinal studies. None of the eligible studies directly compared the findings of different quantitative MR imaging modalities or tried to put together their information (structural and functional). The results of studies with volumetric analysis, MR spectroscopy, and DTI in SCA3/MJD found abnormalities in similar infratentorial regions (the cerebellum and brain stem). Comparison of data across MR imaging modalities was not possible for supratentorial regions because of the following: 1) the results of studies on volumetric analysis were heterogeneous, 2) only metabolites in the corpus callosum were evaluated with MR spectroscopy, and 3) DTI results were based on a single study. We reviewed single studies that performed MR imaging volumetric analysis in SCA2 and SCA7.18,24 Although infratentorial gray and white matter volume loss that correlated with ICARS scores were found for SCA218 and different cerebellar region and supratentorial structure (frontal, parietal, temporal, and occipital lobes) atrophies that correlated with SARA scores were found for SCA7,28 these results must be replicated by confirmatory cross-sectional studies, and the role of the discovered patterns of atrophy as disease surrogate biomarkers should be tested in prospective studies. Only a single study performed MR volumetric analysis in a small sample of presymptomatic individuals with SCA6 and showed no brain atrophy.30 Neither studies on symptomatic patients with SCA6, SCA17, and DRPLA nor studies with quantitative methods other than volumetric analysis, except for SCA3/MJD, were eligible. There is a need for further cross-sectional MR imaging volumetric analysis, MR spectroscopy, and DTI studies for SCA1, SCA2, SCA6, SCA7, SCA17, and DRPLA to better define which techniques and regions are the best candidates for surrogate end points to be further tested in prospective studies. MR imaging fractal27 and multimodal approach analysis also deserves further study in PolyQ-SCA. These studies will probably need to be collaborative initiatives to obtain larger sample sizes that may allow an adequate interpretation and validity of findings. Further prospective studies will be necessary for defining the best surrogate biomarker outcomes for all PolyQ-SCA. The only publication with promising results collected prospectively and published so far17 must be seen as a discovery study. The results need to be replicated by independent cohorts of patients with SCA1 and SCA3/MJD. Moreover, the scarcity of cross-sectional and prospective studies in presymptomatic individuals might explain the present lack of preclinical disease markers for PolyQ-SCA. For instance, in a recent clinical trial, creatine was given to presymptomatic at-risk individuals for Huntington disease,38 and the main trial efficacy outcomes were MR imaging cortical and striatum atrophy at 6 and 18 months after therapy. The authors found significant differences between groups, favoring creatine. Although the clinical relevance of the findings is still unknown, this study raises the possibility of including individuals presymptomatic for PolyQ disorders in clinical trials, irrespective of their carrier status, and of using MR imaging volumetric analysis as a surrogate end point of the disease process before the commencement of clinical manifestations. Such study design should be pursued for PolyQ-SCA in the future. Disclosures: Laura Bannach Jardim—UNRELATED: Grants/Grants Pending: Pfizer Brazil, CNPq 478057/2012, FAPERGS 1209–2551/13–4, CNPq 402968/2012–3, CAPES 061–15, Comments: donation (Pfizer) to help maintain www.redeneurogenetica.ufrgs.br; Travel/Accommodations/Meeting Expenses Unrelated to Activities Listed: Machado-Joseph Disease Foundation, Australia, Comments: travel expenses to attend the International Machado-Joseph Disease Meeting, 2015. A.K., E.R., L.M.V., L.B.J., and J.A.M.S. participated in the conception and design of the study. A.K., E.R., M.CF., T.J.R.R., and J.A.M.S. participated in research project execution. A.K., E.R., and J.A.M.S. contributed to the interpretation of data, and wrote the first draft. All authors reviewed the manuscript. Full articles were obtained by CAPES and the Brazilian Ministry of Education publications portal (www.periodicos.capes.gov.br). E.R. was supported by CNPq. We received financial support from Fundo de Incentivo à Pesquisa e Eventos, Hospital de Clinicas de Porto Alegre.
. An absolute beginner's guide to surface- and voxel-based morphometric analysis. Proc Intl Soc Mag Reson Med 2011;19. http://cds.ismrm.org/protected/11MProceedings/files/ISMRM2011-8410.pdf. Accessed April 7, 2016. Accepted after revision January 22, 2016.